II have linked up with Farley over at Oh Boy, 4th Grade again for another Currently!! I can't believe it's already April! Crazy!!!! Loving: I am so happy that it's SPRING BREAK! I needed a break so badly. I am kind of enjoying having nothing to do. Relaxing, sleeping, spending time with friends…it's perfect!!! Thinking: I am thinking about the NorCal Meet Up! I am so excited it's ridiculous. It's going to be here before I know it! Great friends and great new memories!! Wanting: I want to see my niece so bad! I can't wait to see her over Easter. She doesn't live that far away, but I don't get to see her that often. I'm excited to spend some time with her this weekend!! Needing: I had never heard of the 21 Day Fix until last week. It isn't a diet, so much as a way to learn portion control. I am teaming up with my cousin, coworkers, and friends to complete the 21 Day Fix Challenge. Janet is going to be our coach and I can't wait! If you would like to join me, here is her link: Coach Janet! I am really hoping to feel good in my skin by the time I go to Vegas this summer!!! 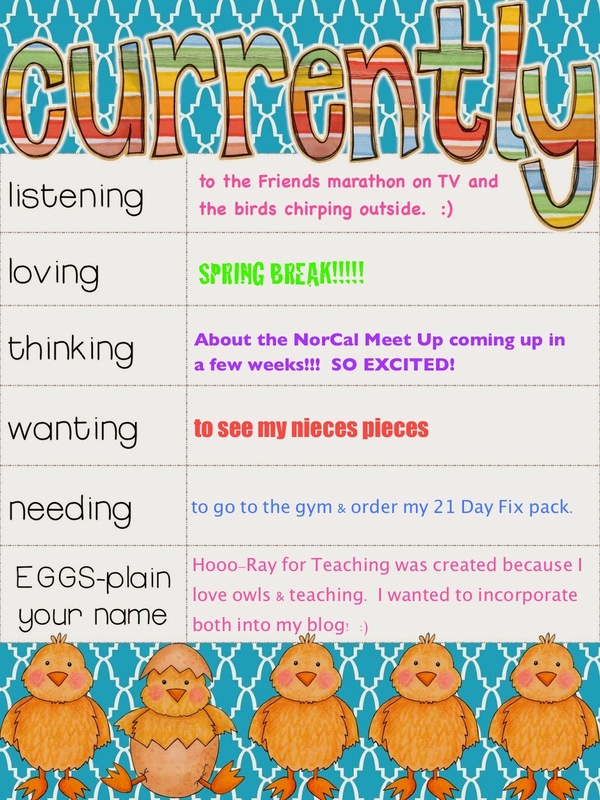 I hope you enjoyed learning about what I am "Currently" up to!! Come link up with Farley! Happy Easter!! Your blog name is so cute!!! And enjoy your much deserved break. I know I will be too!! I could use a few extra days of Spring Break. Once back we only have 7 weeks and 2 days left until summer. But I'm not counting or anything. Good luck with the 21 day fix!